Fun Fact Friday - Why do some elephants have larger ears? 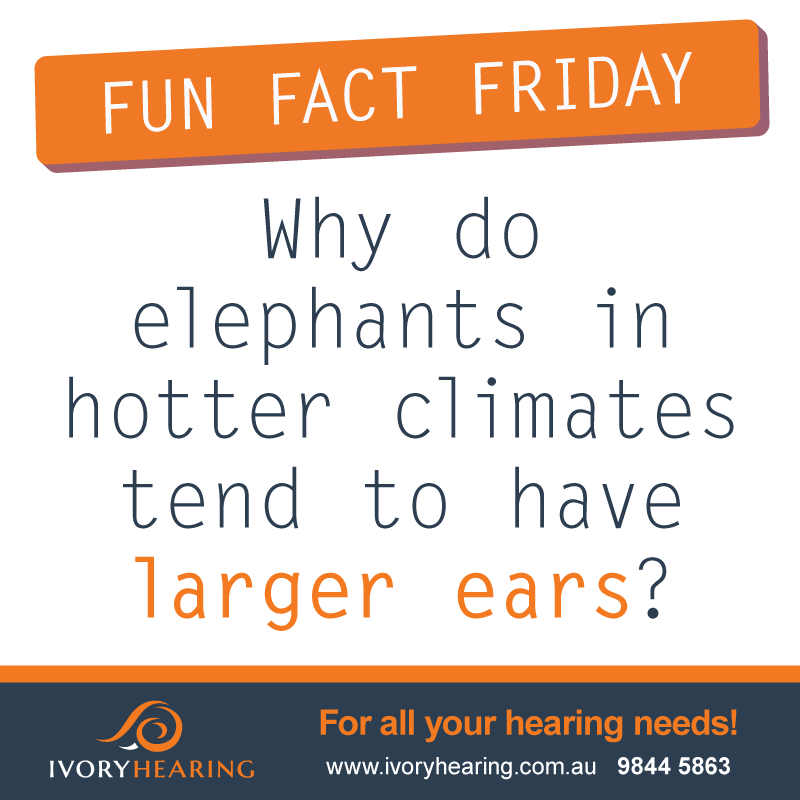 Start Hearing – Blog Fun Fact Friday - Why do elephants in hotter climates have larger ears? Fun Fact Friday – Why do elephants in hotter climates have larger ears? Why do some elephants have larger ears? Elephants are huge, which means they produce a lot of body heat. They also typically live in hot climates. So they need to cool themselves down quickly to keep their body temperature at a constant level. Or else, they could die. Unlike other animals, elephant don’t have sweat glands in their skin. They have to use other ways to cool themselves down. One of the best way to lower their body temperature is by flapping their huge ears back and forth. On the inside of an elephant’s thin ears, you will find a vast network of tiny blood vessels. When the elephant’s body temperature is greater than the temperature of the surroundings, heat is released from the ears and the cooler blood is returned to the body. Differing needs to regulate body heat helps to explain the different ear sizes between elephant species. Therefore, African elephants that live on the hot Savannah will have bigger ears compared to Asian elephants, which live in cooler tropical rainforests.